Miike is all over the map — not just in terms of quality but in his devil-may-care stylistic attitude. Dude will use any and every technique to make his films visually arresting. 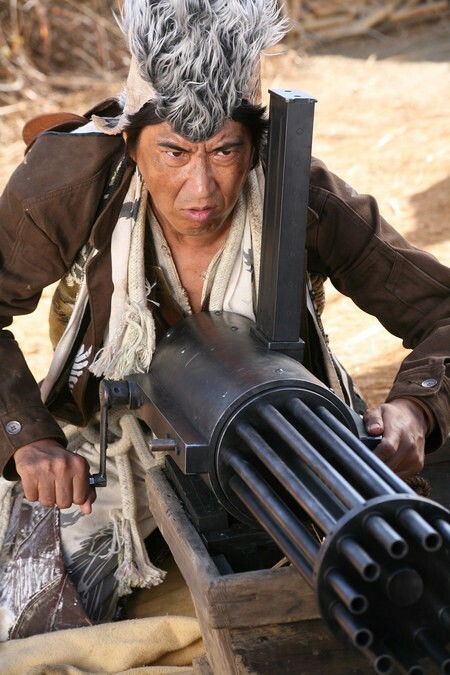 Sukiyaki Western Django is an embodiment of Miike's inconsistency. It may be the one film of his that best encapsulates all that is good, bad and ugly about his style. A lurid, blood-splattered hodge-podge of a movie, Sukiyaki Western Django (hereafter SWD) is a veritable catalog of genres, emotions, narrational tones ... and everything else. Is that a gatling gun on your shoulder, or are you just happy to see me? And the "Django" of the film's title is not a reference to one of the world's greatest-ever guitarists but to Sergio Corbucci's terrific 1966 spaghetti western of that name; it's the same film to which Quentin Tarantino referred in his most recent feature, Django Unchained. And it runs deeper than that: Tarantino, despite being a lousy actor, has a pretty major role in SWD. And both films, in their respective credits, creatively reinterpret Luis Bacalov's fantastic, eponymous theme song to the original Italian film. Oh, you were just happy to see me! The middle word of the title is the most loaded. "Western" proclaims the film's generic identity as if it were a given. But the question of SWD's genre is complicated. What exactly makes a western? Most westerns, even the spaghetti ones, take place between the end of the American Civil War and 1920 or so. Their actions typically unfold in the U.S. and/or Mexico. SWD takes place in a fictionalized Japan, in a town whose name ("Yuta") jokingly refers to the American West. And even though the film makes reference to actual events in Japanese history (such as the Genpei War of the 12th century), the film is gleefully riddled with anachronisms. Characters' hairstyles, clothing, weapons and so forth date from the 20th and 21st centuries. At one point, the Tarantino character even refers to himself as an "anime otaku." At the most obvious levels, SWD flouts the very notion of the western, dislocating it in time and space. The film compensates for this apparent lack by amassing a veritable hurricane of tropes, gestures, icons and references that come straight outta Dodge. SWD contains so many of these tropes that they pretty much amount to the fabric of the film. I found the film's central story to be fairly incomprehensible, largely because characters' motives were rarely made clear. So it was difficult to ascertain why certain actions were committed. (This is not necessarily a bad thing; comprehensibility is often overrated.) In fact, in place of clearly sketched characters with stated goals, Miike substitutes fragments of other films, not all of them westerns. The landmark 1988 anime film Akira is name-checked more than once. For a Few Dollars More and Django are SWD's two western ur-references, but the film's central reference point is Akira Kurosawa's 1961 film Yojimbo. One of the central plot elements has been lifted from that film — that of the stranger coming to a town ruled by two warring families and hiring himself out alternately to both families. He effectively plays both ends against the middle, ensuring that he'll be the last man standing. But stealing Yojimbo's story is essentially the same as lifting the story from a western, since Yojimbo's central idea has been remade into many a film of that genre — most famously,Sergio Leone's A Fistful of Dollars. Indeed, just about every one of SWD's numerous references to western films is deflected, filtered or otherwise arrived at in a roundabout fashion. Some of these references are nonspecific, such as saloon doors and the female characters' petticoats. Some are generic western plot tropes, such as the lily-livered (and, in this case, psychotic) sheriff who is held at the mercy of multiple "bad guys," and the hunt for buried gold. These things accrete pretty rapidly, giving us the impression that Miike really wants us to know that we are watching a western. But is it a western or a "western"? Is SWD authentically part of this genre's storied history, or is it composed of empty gestures that merely refer to westerns without actually becoming one? The question is not easy to answer, and depends on how rigorously we set up generic boundaries and "terms of admission." I'm inclined to be fairly lax about such things, largely because genres are not static categories; they change all the time. The very westerns that Miike cites so heavily in SWD — the spaghetti westerns of the 1960s and 1970s — are now part of the canon of the genre. But when first released, these films caused a great deal of controversy for their irreverence with the generic tradition. Even if SWD isn't a straight-up western, it depends on, adapts and complicates the format. The film wants to be understood through that lens even as it upends many of that genre's conventions. And that's the same process spaghetti westerns went through a half-century ago. I'm not suggesting Sukiyaki Western Django sets a new template for the western, but it's impossible to predict the course of a genre's evolution. Spaghetti had its day; perhaps sukiyaki's time has come.